New Mexico has a long and complex mining history. Many of the state's major towns can draw their origin from the mines. Whether they were supplying the miners with goods or situated near the mines themselves. Most of the mining towns of New Mexico are relics of their former selves. The majority are now considered ghost towns, though some carry on their mining tradition and are popular tourist areas today. Chloride is an important boom town in New Mexico. The town is located about 40 miles to the Northwest of Consequences in the Black Range Mountains. The town was started in 1879 when Harry Pye discovered a chloride of silver on his was to Camp Ojo. He came back with a team of prospectors and they discovered what was known as the Pye Lode near the mouth of the Chloride Gulch. This led to the start of one of the largest mining rushes in New Mexico. Chloride was originally known by a number of names first as Pye Town, Bromide and then finally Chloride. At its peak Chloride was the mining center for a number of silver producing mines that included the Silver Monument, the New Era, The Wall Street, the U.S. Treasury and the White Monument among others. The town began its decline in the 1890s following the exhaustion of the minerals and the return of the United States monetary standard to gold. 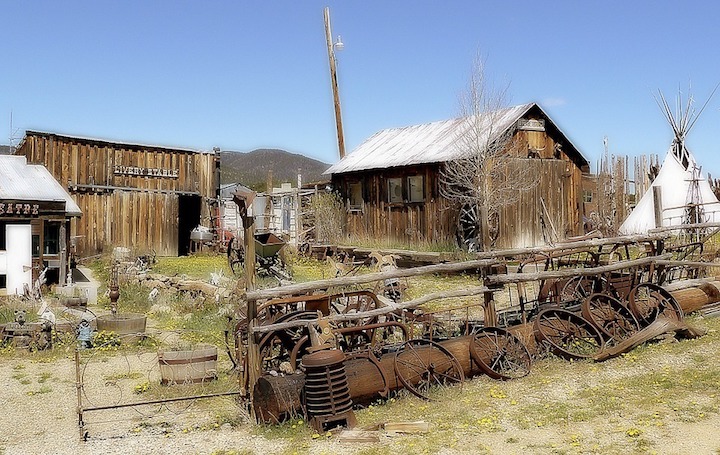 Today it is a ghost town that offers daily tours to the historic mines and the local museum. Los Cerrillos was established in 1879 following the discovery of gold in the Cerrillos by two miners from Colorado. The news of the discovery brought in hundreds of miners who discovered gold, silver, copper and coal in the nearby lands and staked about 1,000 claims before the year end. The town is located at the center of four major mines including Carbonateville silver mines to the north, the Madrid coal mining camp to the South and the Ortiz Mountains and the Placer gold mines also to the south. It flourished as an important transport center in the 1880s for the metal minerals such as silver, gold, and copper and when these were depleted coal mining in the surrounding areas became its important lifeline. Turquoise is still being mined in town. Most of the mining stopped but there are a lot of historical places to visit. Hillsboro was established in 1877 when Dave Stitzel and Dan Dugan discovered gold along the Percha Creek in the Mimbres Mountains. The two filed a claim in the area causing news that brought in more prospectors. This led to the growth of the town. Soon other minerals such as silver and copper were discovered in the surrounding areas bringing in more and more people. Placer gold was mainly mined in Percha Creek, Wicks Gulch, Grayback Arroyo, Warm Springs Canyon and Ready Pay Gulch. Some other productive included the Empire Peak and the Copper Peak. The Copper Flat was the largest copper mine in the area. Mining began to decline in the 1920s and by 1940s only small-scale mining continued. Today it is a small town with hundreds of residents. It is a popular site for prospectors. The town of Kelly traces its origin to the spring of 1866 when Colonel John S. Hutchason discovered silver, lead and zinc ore in the Magdalena Mountains. Hutchason staked two claims and sold another one to Patrick H. Kelley. By 1870s there were several other mining operations in the area and the miners named their town Kelly after one of the richest mines in the area at the time. Mining stopped in the 1930s and most of the residents moved away. Most of the structures were moved to other mining camps such as Magdalena and Socorro. Today, only the church and head frame Billing for the Kelly Mine remain. Kingston is located along the New Mexico State Road 152 within the Black Range. The town was established in 1882 near the Solitaire mine following the discovery of silver at the site by Jack Sheddon. Initially, the mining camp was called Perch City before the name was changed to Kingston. Mining in the areas surrounding the town was intense between 1882 and 1893 when the silver panic put an end to everything. During the period the town was home to 27 silver mines which are estimated to have produced about 6,000,000 ounces of silver. Some of the top producing mines included the Lady Franklin Mine, the Brush Heap Mine, Iron King Mine and the Empire Mine. Other than silver the town was also known for other minerals such as gold, argentiferous galena, and polybasite. Today the town still has a small number of residents and a number of buildings and structures from its glory days. Silver was first discovered in Lake Valley in 1878 by George Lufkin and Chris Watson. This prompted George Daly to move in and set up the Sierra Grande Mining Company. This brought in more miners leading to the establishment of the Lake Valley mining camp. The most productive mine was the Bridal Chamber which produced about 2,500,000 ounces of silver. By 1890 silver production had declined and most of the mines closed. The town remained active until the 1950s producing manganese but effort to reopen the silver mines failed to materialize. Today the town is a ghost town with only a few original structures and a museum still in place. Madrid is located in the Ortiz Mountains in New Mexico. It is the oldest coal producing town in the state. Coal mining in the area started in the 1850s but it was not until 1869 that the town was started. Large-scale production began in 1892 when the Santa Fe Railroad linking the town to the surrounding world was completed. By 1899 Madrid was the leading coal producer in the region and many miners moved from other camps to the town. Coal production continued until the 1950s when mining stopped. Most of the resident left but there are still about 400 residents still in town. Some of the old structures have been restored and there is also a mining museum to learn about the history of the town. Mogollon is located to the Northeast of Glenwood. The town was started in 1876 when James Cooney discovered gold and staked a claim in the Silver Creek Canyon. The news of the discovery of gold brought in a lot of miners and soon a mining town sprang up in the Canyon. Several gold and silver producing mines were set up in the area providing the lively hood for the town. Although the hostile Apache and the wild outlaws were a constant threat to the miners mining continued and the town grew until the First World War when the demand for gold dropped and the most of the mines closed down. The town continued on a downward trend until the 1930s when some of the mines were reopened and it started its recovery. But this was short lived. The Second World War came and mining ceases. The last mine was the Little Fanny Mine which continued to operate until the 1950s when it closed down for the last time. Today Mogollon is a ghost town with a few residents and a number of original structures still standing. Pinos Altos is located in Grant County about seven miles north of Silver City. The town was established in 1860 when gold was discovered in the Pinos Altos Mountains. The town was initially named Birchville after Robert H. Birch, the man who discovered gold in the area. The town took off at a slow pace following the constant disturbance from the hostile Apaches and the following Apache wars. But, after the military built forts in the area in 1869 the hostility ended and the town began to flourish. One of the biggest investors in the town was Senator George Hearst who had investments in a number of mines in Pinos Altos including the Pacific Mine and the Mine Grande. Mining in the area began to decline in the early 1900s following the exhaustion of the ore. Today Pinos Altos is a small village mostly used for summer although a number of original structures have been preserved for tourists. Silver City is the current County seat of Grant County, New Mexico. The town was established in 1870 by Captain John Bullard following the discovery of silver on the nearby Chloride Flat. The town grew rapidly following the influx of miners and the establishment of several mines around it. The town is still a major producer of copper and silver in New Mexico. The best mines are the Tyrone mine and the Chino Mine both operated by the Freeport McMoRan. White Oaks grew as a mining boom town starting in 1879 following the discovery of coal and gold in the Jicarilla Mountains. In 1879 John Baxter staked a claim named, the Homestake Mine after following Mexican prospectors to the site of the discovery. The Homestake Mine became very rich bringing in thousands of miners who set up the town. Mining continued to the late 1890s when the mines began to close and the miners move to other places. Today the town is a ghost town with little to show for its existence.